2018 marks ten years since the financial downturn that affected the global economy and the effects of which are still prevalent today. Some ascribe the crisis to the irresponsible practices of large corporations while others see deregulation at the root of it. In the aftermath of the Great Recession, lawmakers have tried to put new regulations in place that would prevent a similar crisis from occurring. The Dodd-Frank Act which was introduced in 2010 served that exact purpose. Even though the regulations were criticised by some for doing the bare minimum and not tackling some of the fundamental issues that caused the recession, the current administration rolled back some of those measures as well. On the other hand, according to some, other parts of the Dodd-Frank Act have improved. These issues along with her views on the current state of the financial sector in the US were among the topics discussed by Senator Elizabeth Warren on Thursday at the New York Times TimesTalk event. “Families live one bad diagnosis, one pink slip away from financial calamity and they know it. And they read every headline that says ‘economy great,’ and they think, ‘What the hell happened to my family?’ And they are right to ask that question. Because America’s government has failed them,” – Senator Warren said during the interview. She emphasized that although the regulations have mitigated some of the risks that caused the last downturn in the economy, there are dangers lurking from other sources that could cause the next crisis. One way Senator Warren thinks it would be possible to deal with these risks is by breaking up the large financial institutions. The ‘too big to fail’ phrase was coined during the financial crisis because the main source of danger to the financial sector came from the big banks the failure of which could send the whole economy down. In fact, many point to the failure of Lehman Brothers as the first chain in the events that led to the Great Recession. To break up the larger banks would mean reducing the number of institutions that are too big to fail. This wouldn’t be unprecedented in the US history. In the aftermath of the Great Depression in the 30s, two members of Congress introduced a new regulation known as the Glass-Steagall Act, which separated investment banking from commercial banking. Thus, effectively, the new regulations broke up the large banks which dealt with both investment and commercial banking. In 1999, Gramm-Leach-Bliley Act repealed part of the Glass-Steagall Act and allowed these two functions to be taken up by the same institution once more. According to Senator Warren, reinstituting similar measures would reduce the risk of having another financial crisis in the near future. She went even further to suggest that companies similar to Amazon should also be broken up into different companies with various functions. Among other issues discussed by the Senator were the increasing student debt that has put a burden on many workers in the country as well as the expensive health care which is not adequate considering the level of income of the most families. It would be surprising if an interview with a politician in the US didn’t involve any discussion on the incumbent president. This interview wasn’t an exception either as Senator Warren made a few comments about President Trump. She said that Trump “tapped into a genuine anger” of the working class as these people didn’t partake in the economic growth of the past times that was mainly due to the increasing corporate profits. Criticizing Trump, Senator Warren also commented on the tariffs imposed by the current administration on foreign imports from several countries triggering a trade war. 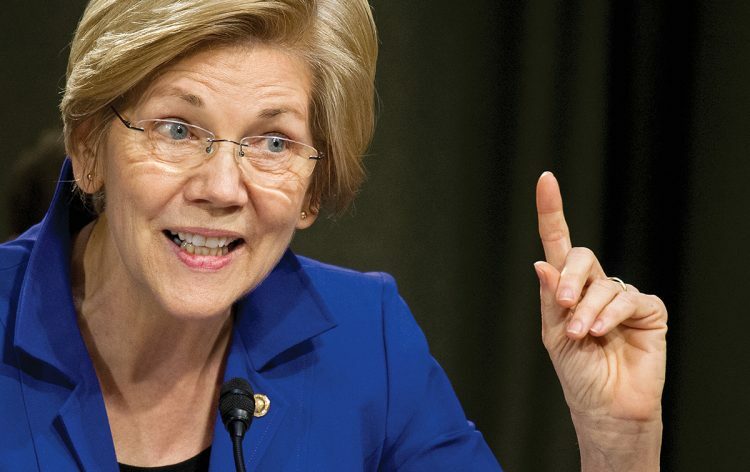 “On trade, I don’t think chaos is a plan,”- commented Senator Warren. Many believe Warren to be a potential Democratic presidential candidate in the next elections in 2020. Although she didn’t discuss these possibilities, the next elections were still mentioned during the interview. Specifically, Senator Warren was asked if she would vote for Donald Trump or Jamie Dimon, the CEO of JPMorgan Chase who recently said that he would be able to beat Donald Trump in an election. “I’m not voting for either one of those guys,” – was Senator Warren’s answer to the question.